Tom O’ Donovan (left) Manager of Next Door Off Licence, Pearse Street, Clonakilty, and staff member Craig Scott proudly show off their award which named the premises as “Ireland's Best Pub Off Licence” which the business attained at the recent Licensing World Bar Awards. Next Door Off Licence in Clonakilty, which forms part of the O'Donovan’s Hotel business on Pearse St. was recently declared “Ireland's Best Pub Off Licence” at the Licensing World Bar Awards. Chosen by an expert industry panel, Next Door of Clonakilty emerged victorious from hundreds of entries in the Licensing World Bar Awards to claim the Sobieski Vodka Bar Off Licence Award at a gala banquet in The Four Seasons Hotel, Ballsbridge, Dublin. Brian O'Sullivan, national managing director of Next Door in congratulating Tom, Dena and Therese O’ Donovan on the win said, “The Clonakilty Next Door Off Licence” is the flagship of the Next Door off licence franchise, which includes over 50 off licence stores nationwide. 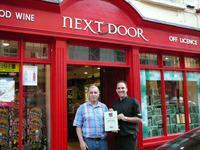 We are very proud to be associated with the business, and that the “Next Door” name is over the door”. Manager Tom O’ Donovan was delighted with the honour saying that much investment and hard work has gone into developing the off licence over the last number of years. “About two years ago we expanded the premises so that there are now two separate entrances, which means two full time people at work there 7 days a week. We are very proud of the large range of products we offer in the off licence which spans an extensive wine range, and foreign beers as well as spirits. While the major supermarkets flaunt their prices, they don’t have the range and speciality products that we carry. All our staff are well trained and regularly attend seminars and training events to keep them up to date with new lines. As a town centre business, we are very grateful for the ongoing support of both our regular and passing customers”, he concluded. Eight members of the O’Donovan’s Hotel, Next Door Wine Club, had three fun filled days of wining, dining and some serious good craic in the Perpignan area of France from 29th March to 1st April 2009. The trip was organised through “The French Tour Company” which is run by two Irish sisters who have been living in the Perpignan area for the last 8 years. The O’ Reilly sisters offer tailor made tours to visitors to the Pyrenees Orientales and with Wine Tours being their speciality, where else would the mad West Cork gang head for? Having flown into Barcelona (no flights to Carcasone until Summer) late Sunday evening, they travelled by coach for two hours over the Pyrenees to their “leabas” at The Aragon Hotel and had a good night’s sleep. After breakfast on Monday morning it was off to a relaxing local spa - the girls revelled in the hot springs, soaking up the sun rays with the snow capped mountains as a backdrop. From there, they cruised down to Port Vendres on the coast and had a wonderful lunch on the marina. A wonderful three course lunch for just 15 euros comprised of delicacies such as Oysters, Lobster Bisque and Salad of Hot Goats Cheese – and these were just the starters. The choice on the mains course offered Confit de Canard, Filets of Merlan (white fish), and to top it all off, the chef proposed Aubergine Crumble for dessert was absolutely delicious. (No wonder! We learned after that he had soaked the aubergines in wine and sugar. Ooo la la!). All of this was, of course, washed down with some very nice Cotes de Roussillon wines and mopped up with plenty of crusty bread, just as the French do. The charming town of Collioure was the next stop, where the Clonakilty group meandered through the cobblestoned streets and pottered around in some of the lovely galleries and quirky shops and practiced their rusty Francais on the baffled locals. Dinner in a local splendid restaurant in Perpignan finished off the day nicely. Tuesday morning was like they had been transported home in their sleep! Grey skies and rain greeted them as they opened their bleary eyes - a perfect day for a wine tour! They visited three very different vineyards and the group of 8 wine buffs were very impressed with the quality and diversity of the wines on offer. They had a delicious lunch in one of the vineyards, deliciously cooked and served up by the wine makers wife, and the wines were chosen by our very own sommellier - the wine maker and vineyard owner himself. They dined in another local favourite restaurant in Perpignan where the meat was cooked on an open barbeque. The restaurant is situated in the old quarter of Perpignan and true to custom, a lively sing song ensued which included renditions of “she moved thru the fair” and “my own lovely Lee” all washed down with copious amounts of good French wine.